(May 7, 2014) The City of Hartford has been selected as the kick off site for “Raise The Caliber” a national advocacy campaign to end illegal gun violence. Central to the campaign will be the unveiling of a public art piece by internationally renowned artist Michael Kalish. The work, a 60-foot high sculpture created from 2,000lbs of shredded illegal guns bought off the streets through voluntary gun buybacks, will be unveiled in Hartford in July and stay for nine months. “In cities across the country, gun violence is impacting too many families, and cutting too many lives short. 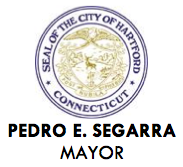 We’re doing everything possible to combat that in Hartford and we welcome anyone willing to stand alongside us to help raise awareness of this issue that affects everyone in our community,” said Hartford Mayor Pedro Segarra. “This monument is truly the most powerful piece I have ever created and I am really honored to hear about Hartford’s enthusiasm for it,” said artist Michael Kalish. Mindich, and has several partners including, furniture designer Joseph Jeup, women’s clothing brand Tibi, and retired Connecticut Police Detective and FBI Task Force Agent, Charles Grady. Jewelry for a Cause partners with cities to fund local gun buyback programs through The Caliber Collection, a series of bracelets and cufflinks engraved forged from illegal guns and shell casings. Joseph Jeup and Tibi support the campaign through a Raise The Caliber-branded lighting collection and t- shirts, respectively. Mr. Kalish will create limited edition, small-scale, versions of his sculpture, and the proceeds from all branded pieces will be used to fund public safety initiatives designed to reduce illegal gun violence nationwide. For more information about Raise The Caliber or to purchase pieces from The Caliber Collection, please visit jewelryforacause.net. This entry was posted in Raise The Caliber™ and tagged Caliber, Charles Grady, Connecticut, gun buyback, Hartford, CT, Illegal Guns, Jessica Mindich, Jewelry for a Cause, Joseph Jeup, kalish sculpture, raise the caliber, The Caliber Collection, Tibi by Caliber Collection. Bookmark the permalink.